In the Processing Settings window, click the SQL tab. To specify a user account that Veeam Agent for Microsoft Windows will use to connect to the Microsoft SQL Server, select the Specify Microsoft SQL Server account with database admin check box and enter a user name and password for the user account. To connect to the Microsoft SQL Server, you must use a Microsoft Windows user account that has sysadmin privileges on the Microsoft SQL Server. You cannot use Microsoft SQL Server accounts (for example, the SA account) to connect to the database. Select Truncate logs to truncate transaction logs after successful backup. Veeam Agent for Microsoft Windows will wait for the backup to complete successfully and then truncate transaction logs. If the backup job fails, the logs will remain untouched until the next backup job session. Select Do not truncate logs to preserve transaction logs. When the backup job completes, Veeam Agent for Microsoft Windows will not truncate transaction logs. It is recommended that you enable this option for databases that use the Simple recovery model. If you enable this option for databases that use the Full or Bulk-logged recovery model, transaction logs may grow large and consume all disk space. In this case, the database administrator must take care of transaction logs him-/herself. Select Backup logs periodically to back up transaction logs with Veeam Agent for Microsoft Windows. Veeam Agent for Microsoft Windows will periodically copy transaction logs to the backup location and store them together with the image-level backup. During the backup job session, transaction logs will be truncated. For more information, see Microsoft SQL Server and Oracle Logs Backup and Restore. You can enable transaction log backup in one backup job only. If you have already configured a job that is set up to back up transaction logs, you will not be able to select the Backup logs periodically option in the properties of another backup job. In the Backup logs every <N> minutes field, specify the frequency for transaction logs backup. By default, transaction logs are backed up every 15 minutes. The maximum log backup interval is 480 minutes. 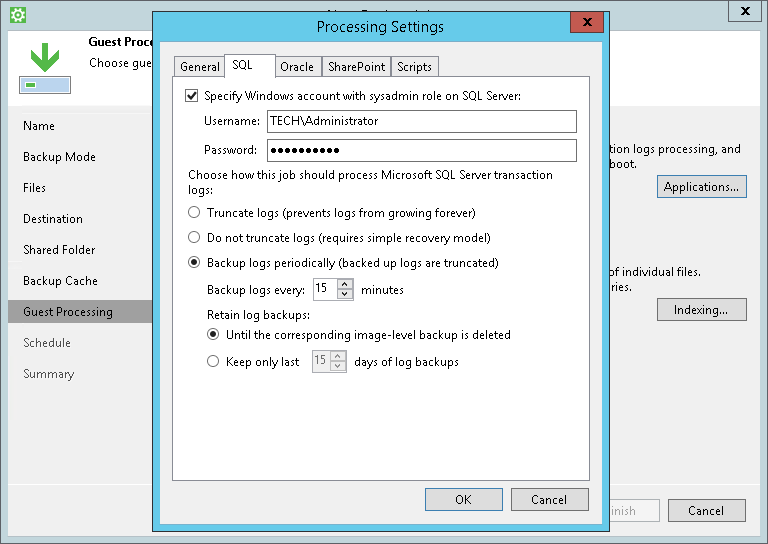 In the Retain log backups section, specify retention policy for transaction logs stored in the backup location. Select Until the corresponding image-level backup is deleted to apply the same retention policy for image-level backups and transaction log backups. Select Keep only last <N> days of log backups to keep transaction logs for a specific number of days. By default, transaction logs are kept for 15 days. If you select this option, you must make sure that retention for transaction logs is not greater than retention for the image-level backup. For more information, see Retention for Transaction Log Backups. Veeam Agent for Microsoft Windows automatically excludes its configuration database from application-aware processing during backup. Transaction logs for the configuration database are not backed up.